Can you help a Railway Enthusiast? "I have been interested in the railway at Maiden Newton for many years and have been researching the history of both the Yeovil - Weymouth line and the branchline to Bridport. I am particulary interested at the moment to find out what information I can regarding the dairy and the milk traffic by rail from Maiden Newton. I'm sure you know that mik was sent away by rail to depots in London at Kensington Addison Rd and Bow. I would like to establish when this traffic ceased and when the dairy in Maiden Newton closed. I have photographs taken at Maiden Newton station, dated 1950, showing milk trucks but I have nothing later. I have also asked several former railwaymen who lived in the village and they have no recollection of the traffic during their working life - both are retired now." If you may be able to provide some more information or know someone who could, please email us and we will put you in contact. 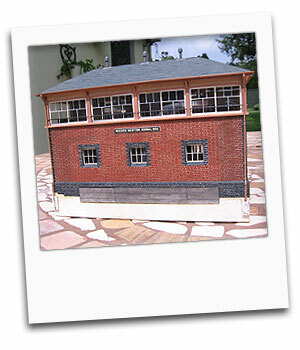 Mr Beale also mentioned that he has been re-creating a model of Maiden Newton signal box, which as you can see from the attached photo, looks an excellent replica.